As part of the Center for Integrative Bioinformatics (CiBi) in the German Network for Bioinformatics (deNBI), we are currently focusing our development efforts on the integration of OpenMS into KNIME. 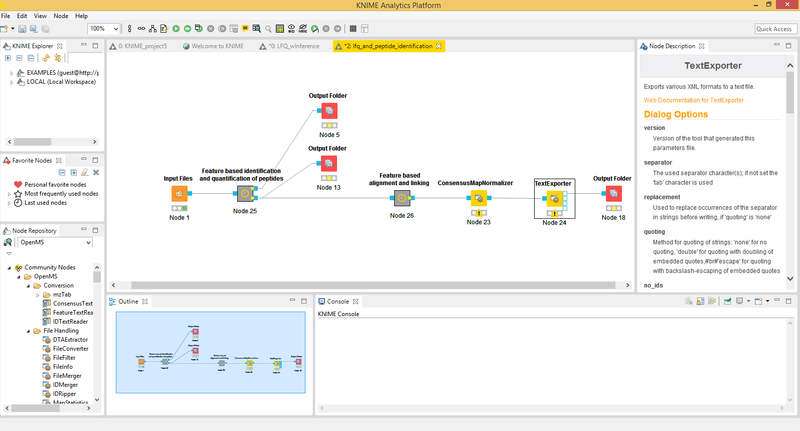 KNIME is a well established data analysis framework which supports the generation of workflows for data analysis. Using a Common Tool Description (CTD) file which is writeable by every TOPP tool and a node generator program (Generic Knime Nodes), all TOPP tools can be made available to run in KNIME. The below screenshot shows an exemplary workflow in KNIME. Installation of OpenMS in KNIME is very easy and platform-independent across Windows, MacOSX and Linux. Download the latest KNIME release from the KNIME website. If you choose the full install of KNIME you most likely can skip the following installation routine since all required plugins should be installed by default. In KNIME click on Help -> Install new Software. Install the required KNIME File Handling nodes from the official KNIME Update Site (a standard entry in the update sites). Choose the update site from the “Work with:” dropdown menu. Filter the results for “File handling” and select the KNIME File Handling Nodes. Click Next and install. Now, the installation of the actual OpenMS plugin. Besides the “Work with:” dropdown menu, choose “Add…”. Use the search or navigate to “KNIME Community Contributions – Bioinformatics & NGS” and select “OpenMS”. Then click “Next” and follow the installation instructions. A restart of KNIME might be necessary afterwards. On Windows you might be prompted to install additional requirements like the Microsoft Visual Studio Redistributable for the conversion software ProteoWizard that is packaged with our plugin. After a restart of KNIME the OpenMS nodes will be available in your Node Repository (panel on the lower left) under “Community Nodes”. Download our Introduction to OpenMS in KNIME containing hands-on training material covering also basic usage of KNIME. See the official KNIME Getting Started guide for a more in-depth view of the KNIME functionality besides OpenMS. When you encounter any problems, please see our Support page and specifically for the usage of OpenMS in KNIME, the KNIME community contributions forum. When in doubt where to turn to, open an issue on our GitHub issue tracker. See the more advanced instructions on our Getting Started page for developers.